Botox short for botulinum toxin A is a neurotoxin. When inserted in the muscle, this toxin blocks nerves from transferring to immobilize movement for a certain period of time. When applied to the face, the wrinkles are straightened out. It is also effective after square jaw reduction and calf reduction surgeries. Extract unnecessary fat from abdomen, thighs, buttocks using a centrifuge so that only the fat is grafted into the face. Then transfer fat into the problem areas. A fat injection in Korea can improve the overall dimension of the face which amplifies anti aging to give you a younger looking face. 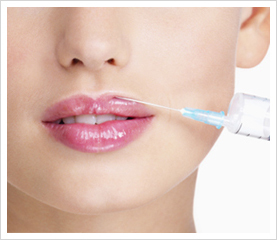 Fillers are created from various natural/artificial substances and are inserted into the skin to expand soft tissue. In general, fillers are used to replace natural substances in the skin (collagen, hyaluronic acid) lost due to aging, and to improve wrinkles on the face. Also, fillers are used for burnt scars, cell damage, deformed scars and birth defects. Common fillers are restylane, juvederm, dysport, and radiesse. Also known as semi permanent make up, Permanent Cosmetic Make-Up inserts pigments into the outer layer of the skin which creates the effect of having make-up on. The pigments inserted into the outer layer of the skin from the permanent procedure, will in time, clear out, and in 2~3 years, it will naturally disappear and remain semi permanent. The main feature is that it uses pigments that match the skin tone which will look natural and bring out the facial contour, adding the effect of a slight touch of make-up and a more defined appearance. Recently, having an unpainted face has become the conversation topic among women who want to appear beautiful without having to put on make-up, causing permanent make-up to rise to popularity. Permanent make-up has the effect of having a perfect make-up on with simple skin make-up and also avoids thick make up which helps create healthier skin. Eyebrow, Eye line, Lip line, and Hair line procedures are most common for Permanent Cosmetic Make-up but Korean hospital is trying to expand its field by fixing faulty semi permanent make-up, modifying tattoos, revisions, correcting unnaturalness after surgeries, removing scars, etc. The Fraxel restore® DUAL is a non-invasive procedure that relies on a laser for pigment removal of the epidermal and dermal layers of the skin. It is an upgrade from the Fraxel restore® system, which uses a laser wavelength of 1550nm; best for deeper skin conditions. The Fraxel restore® DUAL uses an additional laser that has a wavelength of 1927nm, which is best for the superficial skin layers, and larger or multiple areas of the body.